Mobile users curious about which chip might power their favorite gadget next year will want to get a sneak peek at the specs for Nvidia's Tegra 4 processor, promising six times the graphics power of the current Tegra 3. 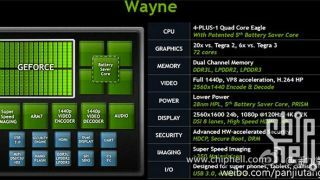 Engadget reported Tuesday that a Nvidia presentation slide leaked in China appears to reveal the company's plans for its forthcoming Tegra 4 processor, codenamed "Wayne." Featuring the same 28nm process found on the current (and very power efficient) Tegra 3 processor, the slide describes the Tegra 4 as packing 72 cores - six times the power of the Tegra 3, and a whopping 20x boost from the Tegra 2. With all that graphics power, Tegra 4 cores will be capable of powering a display up to 2560 x 1600, 1080p at 120Hz and there's also a rather brief mention of 4K, should you have sufficient HD content to throw at it. Despite the huge leap in graphics processing, the leaked slide shows no bump for the actual CPU cores, although Nvidia does appear to be moving the Tegra 4 to ARM's latest Cortex-A15 design. Judging from the specs, the Tegra 4 might also be Nvidia's first mobile processor to come packing USB 3.0 along with dual-channel DDR3L memory. The report appears confident that the chipmaker may use the upcoming Consumer Electronics Show 2013 in early January to officially debut the Tegra 4, where they'll likely be duking it out with Samsung and Qualcomm's latest and greatest.